CONEY ISLAND – “Hey, hey. Ho, Ho. 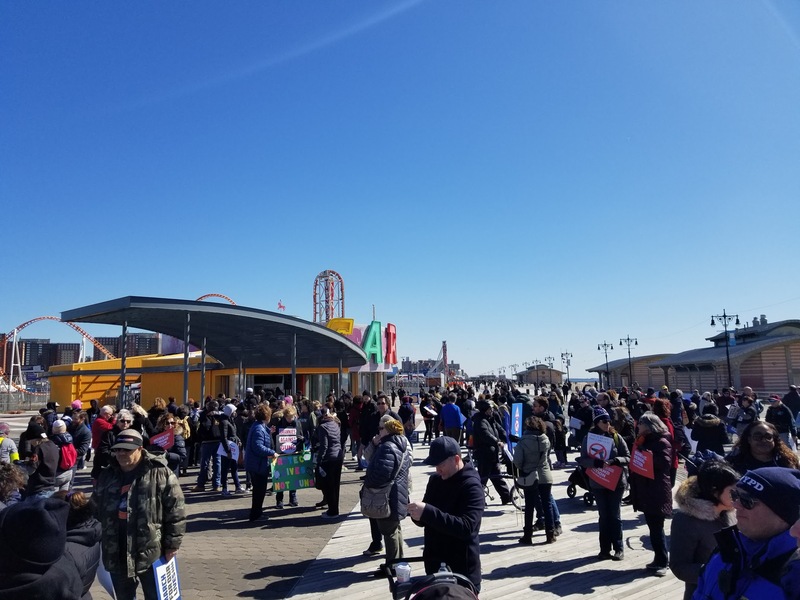 Gun violence gotta go.” The Coney Island boardwalk reverberated with the sound of loud, powerful chants against gun violence during the March For Our Lives, last Saturday, March 24. 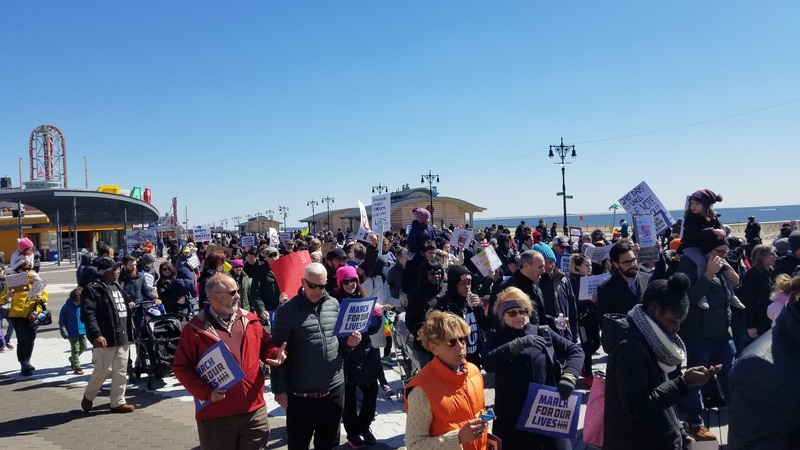 The neighborhood march was just one of 800 marches across the nation, urging Congress to control guns and prevent mass shootings. Hundreds of Brooklynites swarmed the boardwalk near the infamous red Parachute Jump. Beyoncés “I was here” was heard through the loudspeakers at the beginning of the rally, organized by the Coney Island Anti Violence Collaborative (CIAVC), a non-profit organization and a coalition of Coney Island residents and politicians to address the issue of gun violence. Speaking at the march was State Senator Diane Savino; District 47 Councilman Mark Treyger; the co-chair of CIAVC, Joe Herrera; a representative from Comptroller Scott Stringer’s office, Ari Kagan; activist and member of CIAVC, Mathylde Frontus; and students from Liberation Diploma Plus High School. In 2014, Herrera was on his way to a YMCA in Coney Island where his sons were playing basketball. He then saw an ambulance and heard that there was a shooting. He panicked and ran up the stairs to see that his kids were safe. “But then my heart hurt because someone else’s child was in that ambulance. I walked away from that YMCA saying someone has to do something about this,” he said. 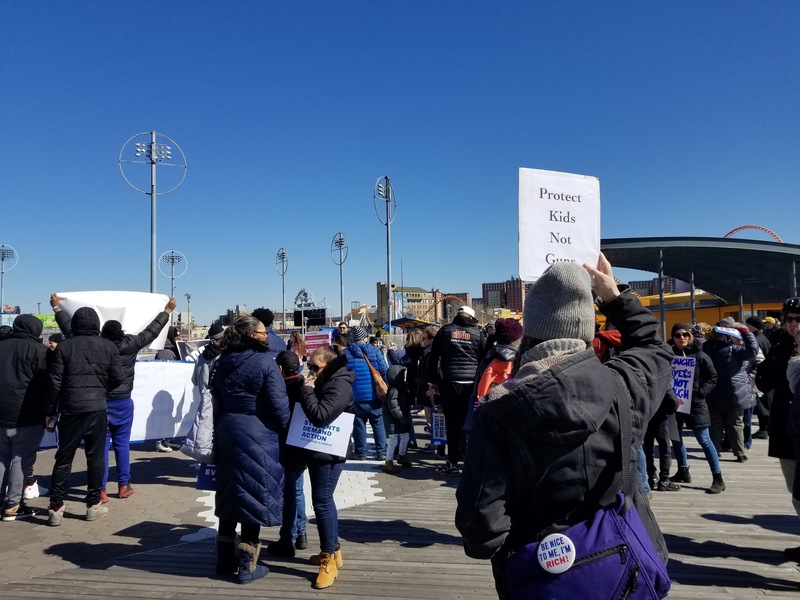 Though the march was initiated after the shooting in Parkland, the speakers relayed the simple fact that Coney Island was also not immune to gun violence. “In the 60s, a woman by the name of Rosa Parks took a stand. And in the laws of physics that says for every action, there’s an equal and opposite reaction. In that equal and opposite reaction… her stand changed the landscape of America,” he said. 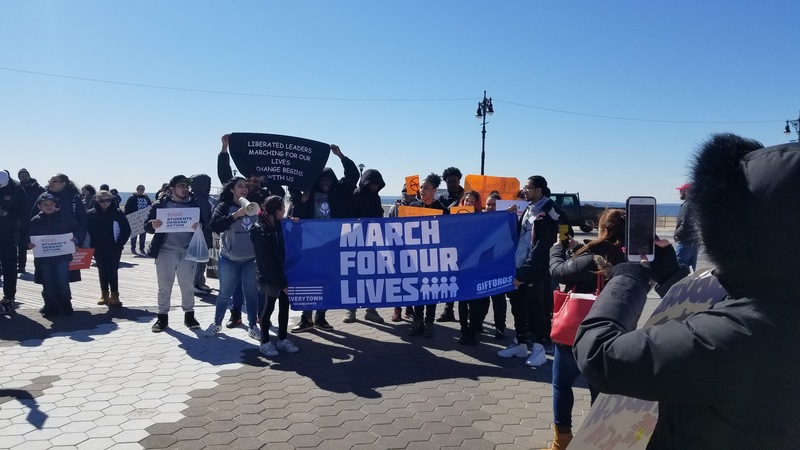 Savino reiterated the purpose of the march, but she also spoke about how NY state has “led the way” for gun control with the NY SAFE Act, arguing that it was one of the strongest gun laws in the country. But that is not enough, she said. He criticized President Trump for calling for guns to be given to teachers in school. He referred to him as “tweeter-in-chief.” As a former public school teacher, Treyger gave his own suggestions. 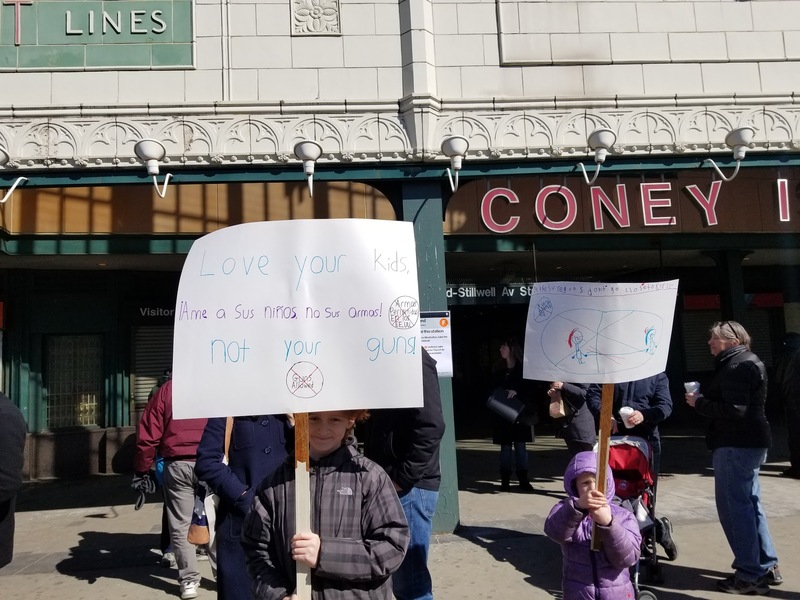 After the rally ended, young children, parents, and neighbors held their posters, while they chanted and marched on Coney Island. You can view the entire live stream of the march right here. Additional reporting by Liena Zagare.